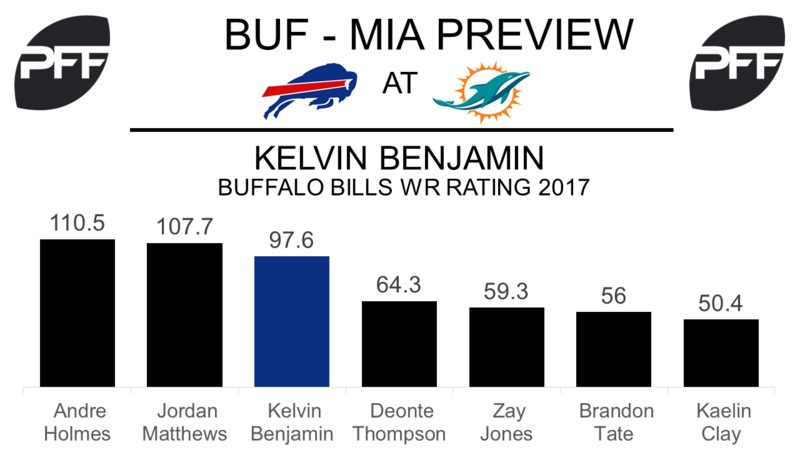 WR Kelvin Benjamin vs. CB Xavien Howard – Benjamin will be the Bills’ biggest receiving threat against the Dolphins. He has an overall grade of 79.1, which is ranked 28th among receivers and is the highest by any Bills wideout. Since joining Buffalo, Benjamin has the second-most targets and the most receptions of any receiver, and his wide receiver rating when targeted during said span of 97.6 is the best by a Bills receiver. Despite earning an overall grade of 51.5 during the season, Howard has arguably been the best corner in football over the last few weeks. Since Week 12, Howard has only allowed a passer rating of 2.4 when targeted, which is the best by any corner in the five-week span. Howard also ranks inside the top-10 for yards per coverage snap (0.44) and coverage snaps per reception (37.4). T Dion Dawkins vs. Edge Charles Harris – Two rookies who have had excellent debut seasons will go head-to-head on Sunday. Dawkins has done a great job in pass protection all season. Since Week 7, Dawkins has only allowed 14 total pressures and is one of 10 offensive tackles with at least 100 pass-block snaps not to allow a sack. In fact, Dawkins hasn’t allowed a sack since Week 5. Harris has the fourth-most pressures by a rookie edge defender this season with 34, and his pass-rushing productivity rating of 9.1 is the sixth-best. QB Tyrod Taylor’s play under pressure – The Dolphins’ defense has been one of the fastest at getting pressure this season. Their average time to pressure of 2.32 seconds is the second-fastest in the NFL. With the likes of Ndamukong Suh and Cameron Wake, who have a combined 99 total pressures, Bills blockers may have some trouble ahead of them. Taylor has seen pressure on 37.7 percent of his dropbacks this season, the seventh-highest rate of any quarterback. However, he has handled it fairly well, recording a passer rating of 77.1 under pressure that ranks seventh among quarterbacks. 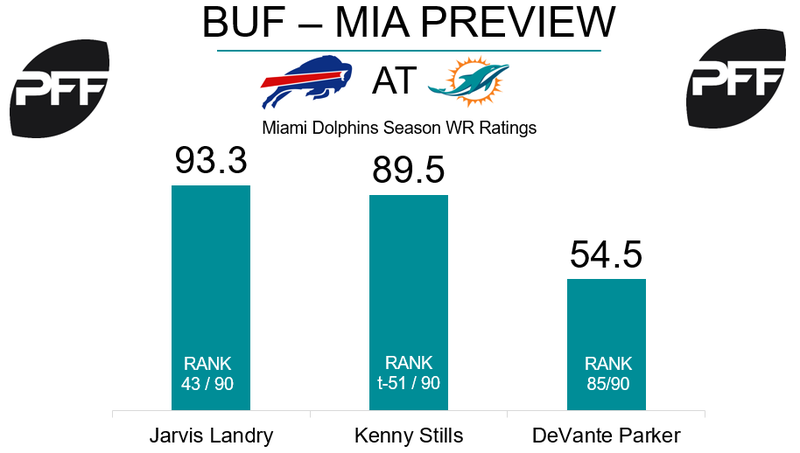 WR DeVante Parker vs. CB Tre’Davious White – White has been superb in 2017, as his overall grade of 91.4 is third-best in the league among corners, and he is coming off a game against New England in which Tom Brady only threw at him once. Parker has struggled by and large this year, as quarterbacks have a passer rating of 54.5 when throwing at him, which is 85th out of 90 qualified receivers. Parker’s overall grade of 74.5 ranks 50th out of 116 qualified receivers. The advantage on paper for this matchup clearly favors the Bills. T Laremy Tunsil vs. Edge Jerry Hughes – Tunsil has struggled this season, as his overall grade of 59.5 puts him 47th out of 87 qualified offensive tackles. His pass-blocking efficiency of 95.6 ranks 27th out of 81 offensive tackles and he has allowed seven hits, tied for the 12th most in the NFL. Hughes has been solid, earning an overall grade of 81.6, tied for 35th-best out of 111 qualified edge defenders. However, Hughes is very good against the run, as his run grade of 89.2 is tied for fifth-best among edge defenders. Tunsil is doubtful for this game, and Zach Sterup would likely be the next man up. WR Jarvis Landry vs CB Leonard Johnson – Landry has been very effective in the slot, as he has the 10th-best catch rate at 77.2 and has the seventh-most receiving yards at 562. He also has yet to drop a pass from the slot, which is tied for the best among 63 receivers that qualify. Leonard Johnson will be charged with covering him in the slot, and that may favor the Dolphins. Johnson has allowed 517 yards when in coverage in the slot, which is tied for the third-most among 56 qualified cornerbacks. Look for the Dolphins to try and exploit this matchup when it presents itself.